Western blot analysis of extracts from KARPAS-299 and NK-92 cells using Jak3 (D1H3) Rabbit mAb (Biotinylated). KARPAS cell line source: Dr. Abraham Karpas at the University of Cambridge. 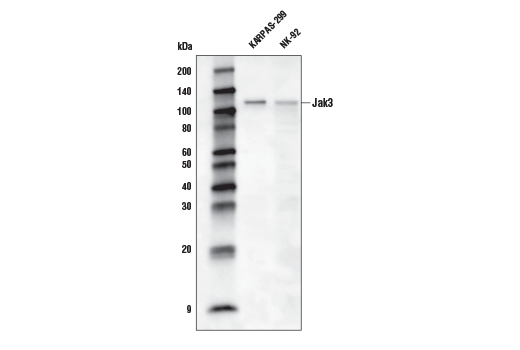 Jak3 (D1H3) Rabbit mAb (Biotinylated) recognizes endogenous levels of total Jak3 protein. Monoclonal antibody is produced by immunizing animals with a synthetic peptide corresponding to residues near the carboxy terminus of human Jak3 protein. This Cell Signaling Technology antibody is conjugated to biotin under optimal conditions. The biotinylated antibody is expected to exhibit the same species cross-reactivity as the unconjugated Jak3 (D1H3) Rabbit mAb #8827. Members of the Janus family of tyrosine kinases (Jak1, Jak2, Jak3, and Tyk2) are activated by ligands binding to a number of associated cytokine receptors (1). Upon cytokine receptor activation, Jak proteins become autophosphorylated and phosphorylate their associated receptors to provide multiple binding sites for signaling proteins. These associated signaling proteins, such as Stats (2), Shc (3), insulin receptor substrates (4), and focal adhesion kinase (FAK) (5), typically contain SH2 or other phospho-tyrosine-binding domains. Leonard, W.J. and O'Shea, J.J. (1998) Annu. Rev. Immunol. 16, 293-322. Darnell, J.E. (1997) Science 277, 1630-5. VanderKuur, J. et al. (1995) J Biol Chem 270, 7587-93. Argetsinger, L.S. et al. (1995) J Biol Chem 270, 14685-92. Zhu, T. et al. (1998) J Biol Chem 273, 10682-9.